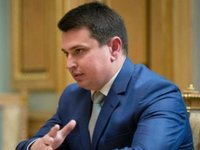 National Anti-corruption Bureau of Ukraine Director Artem Sytnyk has said the consequences of the repeal of the article of the Criminal Code on illicit enrichment are irreversible and linked to the decision of the Constitutional Court with the prevention of consideration of cases by the new anti-corruption court. "Is it possible to turn this situation [closing criminal proceedings under the article on illegal enrichment] around? Today I don't see such a possibility, because the court decision cancels the effect of this article and even if the relevant law is passed by parliament, it will only apply to those acts that will be committed after the entry into force of the law," Sytnyk said during a press conference on Thursday. "Our work in this part ended with the fact that those whose actions fell under this article, who served notices of suspicion, can avoid punishment," he said. Sytnyk added, "Perhaps, and most likely, this is due to the fact that in the near future the High Anti-Corruption Court will start work and these cases could be referred to the court." He said anti-corruption agencies had offered a new draft bill of article. "But it is necessary to recognize that the consequences are irreversible: There is no legal way to resume previous (criminal) investigations," he said.